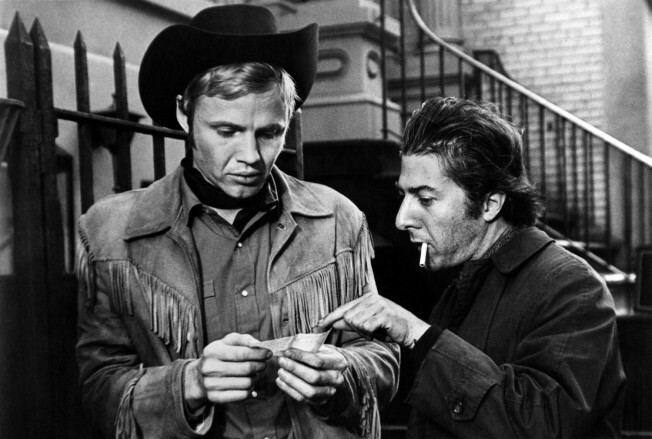 See Midnight Cowboy on the big screen at the DGA Theater. EVERYBODY'S TALKIN: These days every dude lining up for free PBRs at the Lazy Catfish works that vaguely sleazy 1970s drifter look - but in Midnight Cowboy, it wasn't fashion, people. Jon Voigt and Dustin Hoffmanwere sleazy drifters. See the film turn 40 at the Director's Guild of America Theater, 7:30PM. AFTERNOON DELIGHT: We can't be the first to ask this, nor the last: Why does the Motley Crue show at Madison Square Garden start at 5:30PM? Does the band need its beauty sleep? More likely they'll give supporting acts The Last Vegas, Theory of a Deadman and Hinder plenty of stage time before rocking our world. 5:30PM. NE ME QUITTE PAS: Vickie Phillips saves what could be a standard cabaret evening by centering it around the music of Kurt Weill, Charles Aznavour and Jacques Brel. You certainly can't fault her taste. Don't Tell Mama. 8PM.